Intentionality (intend/intent) comes from to English through the French from Latin, starting with “in,” meaning “in, at.”The base word, “tendere,” means “to stretch.” Makes no sense, given our current use of the word! Yes. I don’t want to sit around and wait for my goals to happen, or wallow through life generally in their direction. I want to purposefully stretch out for them, aim for them. Dear God, may 2013 be a year of intentionality for me. May I be about the real, the bold, the intentional this year. Above all, may I intentionally be about Your will! through the laying on of my hands. For God did not give us a spirit of timidity, but a spirit of power, of love and of self-discipline. Dear God, may 2013 be a year of intentionality for me. May I be about the real, the bold, the purposeful this year. Above all, may I intentionally be about Your will! I wrote on this a couple of years ago (three), but did not follow through (as witness by the fact I’m currently giving up diet Coke AGAIN.) I love the Disraeli quote, however. For some Word Nerd humor, check out this Atlantic Wire link to the words that will be banned in 2013. I saw the national emblem in the trash today. I was taking a walk with the dogs today, when an eagle cried out. (Check out the Soundboard site, which has recordings of bald eagle cries and vocalizations). I spotted him atop an electric post, watching, I suppose, to make sure no rodents or a random salmon happened by. We turned the corner, where we would pass a community trash dumpster. The eagle came soaring over our head, crying out urgently. I looked around, and that’s when I saw it. On the ground by the dumpster with a bunch of ravens was another eagle–its partner, I presume. That eagle flapped up to the top of the open, overflowing dumpster (I’ll forego the whole environmental/bear-and-other-wildlife-safety lecture here) and gave us the old eagle eye as we walked by. I was probably 25 feet away. Awesome. Didn’t that eagle realize it is our national emblem? High and proud and soaring over the spruce. Isn’t that how an eagle should be? Alas, no, they are dumpster divers. It made me think of our Christian walk. We are children of the King, with 24-7 access to the His throne. The King of the universe loved you, loved me, enough to die for us. Yet we continue to wallow in the world. It may look like giving out of obligation instead of the heart. …a TV show that you know Jesus would not want you watching. …too much social media time. It may look much darker than either of those, much more hidden. What it looks like in your life is between you and God. As for me, I want to be intentional about my Christian walk this year. I want to live as a child of the King, not as a dumpster diver in the trash of the world, or the quagmire of my own selfish desires. But as we face a new, God-given beginning, I urge you to let go of the past and ask God to show you where He wants you to soar, to where he is calling you. Lord, help me to take my eyes of the world. Help me to take my eyes off myself. Help me to focus on You, and You alone. For You are my savior, my Lord. May 2013 be full of strength and may you mount up with wings as eagles in faith. May Christ Himself be the wind beneath your wings. The picture in this blog is not mine, but check out my own pictures of eagles, taken from my front window here. I wish that the bald eagle had not been chosen as the representative of our country, he is a bird of bad moral character, he does not get his living honestly, you may have seen him perched on some dead tree, where, too lazy to fish for himself, he watches the labor of the fishing-hawk, and when that diligent bird has at length taken a fish, and is bearing it to its nest for the support of his mate and young ones, the bald eagle pursues him and takes it from him…. Besides he is a rank coward; the little kingbird, not bigger than a sparrow attacks him boldly and drives him out of the district. He is therefore by no means a proper emblem for the brave and honest. . . of America.. . . For a truth, the turkey is in comparison a much more respectable bird, and withal a true original native of America . . . a bird of courage, and would not hesitate to attack a grenadier of the British guards, who should presume to invade his farmyard with a red coat on. 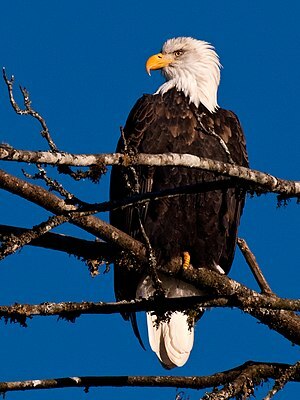 For the story of how the eagle became the national emblem, check out this awesome Bald Eagle Info website.